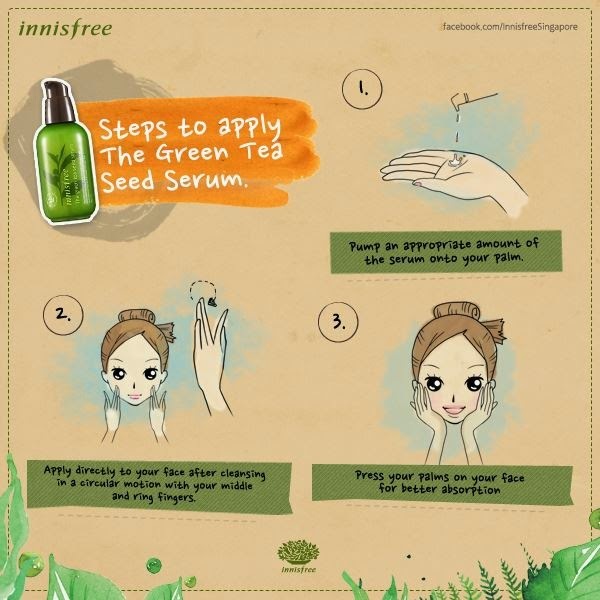 The Green Tea Seed Serum is packed in a rectangular box made of recycled material. The one I own is the 2014 new version, formulated with an improved formula — "100% Fresh Green Tea Essence + DOUBLED Green Tea Seed Oil". 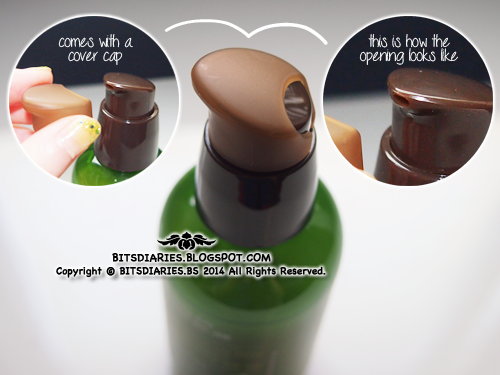 It comes in a green bottle with a brown pump top and also comes with a matte brown cover/lock cap to prevent leakage and at the same time, I guess it helps to prevent dust and dirt from entering the opening hole of the pump. Pump out an appropriate amount of serum and massage it on desired area. 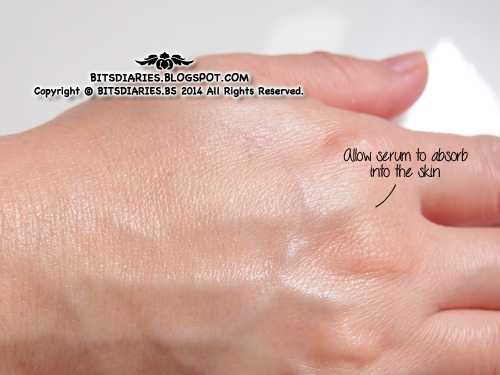 After massaging, allow serum to absorb into the skin. After a few minutes of application, the serum gets absorbed into the skin! It does not feel greasy or sticky at all. However, if apply too much, it does leave a sticky layer... Well, just a little will be enough. FYI, I usually use ½ to 1 pump. As seen on my mom's hand in the pictures above, the serum has an opaque white color and upon massaging on skin, it will become transparent/colorless. As for the consistency, it has a lightweight, watery serum texture. Before applying the serum, my mom's skin moisture level was 35.4%. 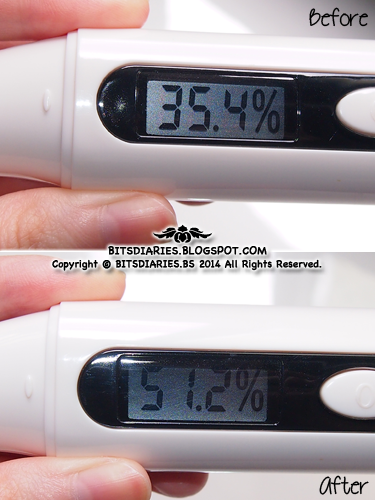 After applying the serum, my mom's skin moisture level increased to 51.2%. Moisture gained before and after the serum application was 15.8%. I concluded that this serum is indeed moisturizing. 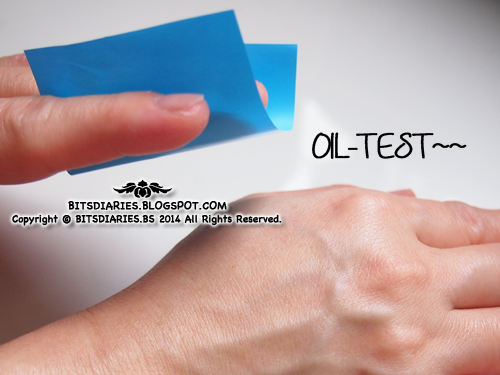 How much oil do you think the oil-blotting sheet would absorb? Revealing the result~~~ Did you guess it right? In case you don't know..., every skin care product, including product labelled 'oil-free', contains some oil. 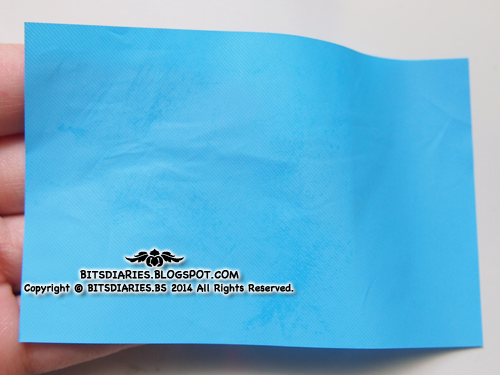 As for the oiliness of this serum, you can judge from the picture of the oil-blotting sheet. The result of the amount of oil being absorbed is really minimal. In my opinion, I consider this as non-greasy. Somehow, I find it smells like perfume! The scent is very pleasant and refreshing. I do LOVE the scent however, I think it's a little too overpowering for face product. 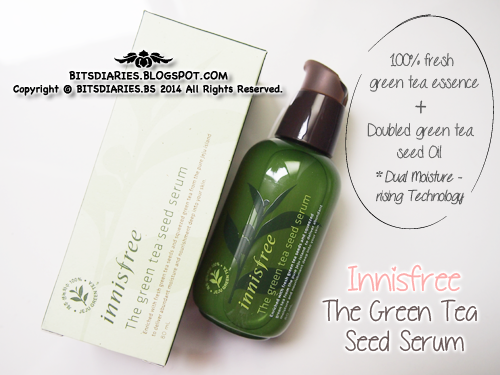 Verdict: The Green Tea Seed Serum is really moisturizing~ It leaves my skin feeling refreshed and hydrated! Well, I absolutely love to use this at night because well... my bed is placed facing the air-conditioner so every night I sleep with the cold wind blowing directly on my face. This serum actually helps prevent my skin from getting dry from the air-conditioner's wind. 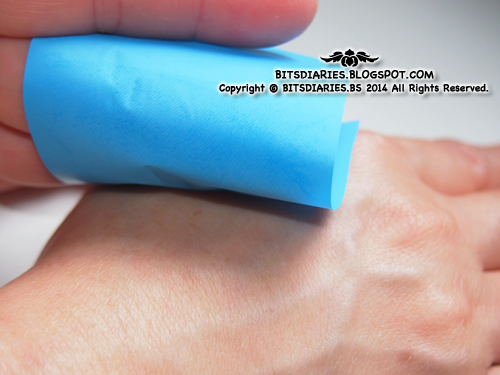 Therefore, I would say that it does provide more than enough moisture to hydrate my skin. However, I'm not sure if this would supply enough moisture for the winter season. On the other hand, it's lightweight in consistency yet non-oily, which is absolutely perfect for summer, for people who have oily/combination skin and lives in humid and hot country. FYI, I did not experience any breakouts at all. If your skin needs a boost in hydration, definitely give this a try! I love innisfree skincare products!! From the serums i've tried they're definitely really lightweight, it's a shame you found the scent too strong!! Hi there, where can i buy this product?? Need to try it.